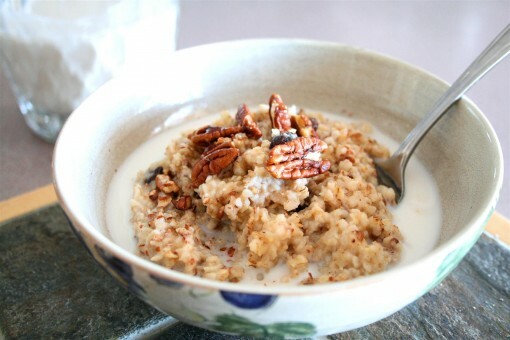 Ideas for Oatmeal was posted on February 6th, 2011 and is filed under Breakfast, Healthy Living, Recipes. This entry has 8 comments. You can follow any responses through the RSS 2.0 Comment Feed. In winter I often crave a warm breakfast. Sometimes it’s an egg scramble or pancakes, but I have to say that oatmeal usually gets trump. It’s just perfect for one of those cozy mornings where you feel like eating in your pajamas while standing over the heat vent. Yes, I do that. And yes, I’m usually cold. Winter and I have never warmed up to each other. Literally. Let’s just say that hot cereal and I get along. But I admit it, despite the wholesome characteristics of oatmeal, sometimes it can get a little dreary. I usually have it with a drizzle of honey and a smattering of nuts. Sometimes I add almond milk. Good, but boring. I decided to become more adventurous. So here’s some fun ways I found to shake us oatmeal fans out of our ruts. This one is my absolute favourites, even though it sounds slightly strange. I assure you, adding the yogurt is not weird, because it becomes creamy goodness. I miss dairy yogurt so much, especially when eaten this way. For those of us who wish they could magically transport themselves to the Bahamas for the winter, this is the cheaper alternative. My second favourite. Apples are delicious cooked…this one reminds me of apple pie. I’m not crazy about eating bananas plain, but I love them in everything else. Banana bread is scrumptious. Here’s the oatmeal version. -Grind the smaller seeds. I don’t just sprinkle the flax on, because it needs to be ground to get all the benefits. It’s so easy to just use coffee grinder to crush sesame seeds, poppy seeds, and flaxseed. -Top it off with fruit! I like my oats with berries, bananas, and pears. How do you eat your oatmeal? Are you into trying different flavours or do you like to stick with the same old? What great ideas – the coconut one sounds especially awesome! Coconut in oatmeal sounds really fabulous! I make it with 2tsp of cocoa, 1 tbsp of peanut butter and a mashed banana. Usually don’t sweeten it but if I do just a sachet of stevia. It tastes like delicious banana bread but with the cocoa cooked into the oats it is more like a delicious treat and the peanut butter makes it creamy. nom nom nom could have some right now! Callie and Angie…it’s so delicious. Gemma, I will have to try that. Sounds especially yummy to the chocolate crazed woman I am. Great ideas! I’m always looking for ways to spruce up my oatmeal! Having burned out on box cereals, I began to experiment with oats. While i will do a variety of combinations, the one that i do most is: oats, flax meal, cinnamon, honey, raisins, and chopped walnuts cooked in skim milk in the microwave for 1min. 45 secs. In season, I will add fresh fruit rather than raisins. Nutrition all the way.